More than one will have verified that when you are going to deliver the loads to the companies of the game, in the majority there are no ambient sounds. 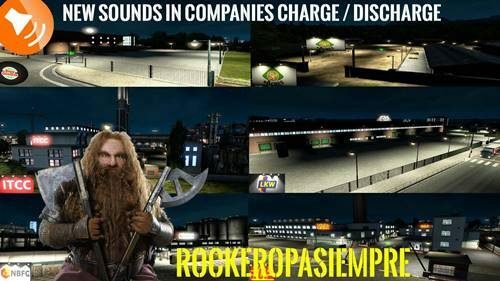 This mod adds sounds to all the companies (original European) of the game. The few companies that had sounds have been modified and added new sounds. Some companies have even added music for workers. In the video you can see a small sample. Added 69 new and totally different sounds. It has been almost a month of work between compiling and mixing sounds. I hope you enjoy it. Hi how is it going More than one will have verified that when you are going to deliver the loads to the companies of the game, in the majority there are no ambient sounds. This mod adds sounds to all the companies (original European) of the game. The few companies that had sounds have been modified and added new sounds. Some companies have even added music for workers. In the video you can see a small sample. Added 69 new and totally different sounds. It is compatible with other sound mods.